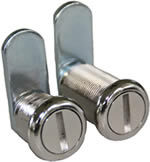 Tubular Plunger Locks or 2610 locks are designed to lock sliding doors or cabinets. When unlocked the lock cylinder will pop outward causing the locking bolt to retract or move in unlocking the door. Can be used on both metal or wood doors. Tubular Slam Latch Locks or 2537 locks are designed to be closed (latched) without using a key. The spring latch bolt will depress when lock is pushed in. Once the lock is pushed in the spring bolt latches a key is needed to reopen. Abloy Cabinet/Boat Lock is a unique new design in high security protection for cabinet and marine applications. Once unlocked the key is no longer needed to operate the lock. This lock is constructed of corrosion resistant materials used for the internal mechanism making this a great lock for the marine environment. 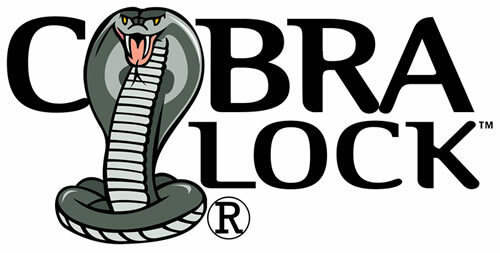 Cobra Tool Operated Locks can secure many different types of devices. 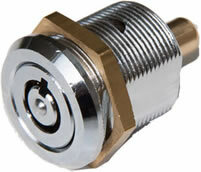 Each are 1/4 turn operation and can accept many different types of locking cams. 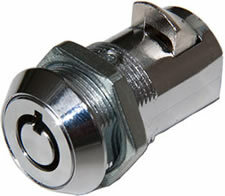 Can be operated by a simple screwdriver or even a quarter. Desk Locks come in many different types, sizes and finishes for most wood and steel desks and cabinets. These locks can be keyed alike or keyed different. Glass door locks provide security for glass style display doors that slide. 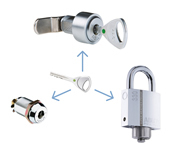 These locks are available in either the standard lock cylinder or the high security lock cylinder.